A special meeting of the Brick Township zoning board that had been set for Wednesday night has been canceled. Notices were posted around town hall on Tuesday saying the hearing, in which board members were to consider the construction of 92 apartments and retail space on what has become known as the “triangle lot,” was canceled by the lot’s owner. Kamson Corporation, a real estate development firm, is the applicant. Mayor John Ducey said after Tuesday night’s meeting of the township council that he did not know if the cancellation had anything to do with what occurred earlier in the evening. 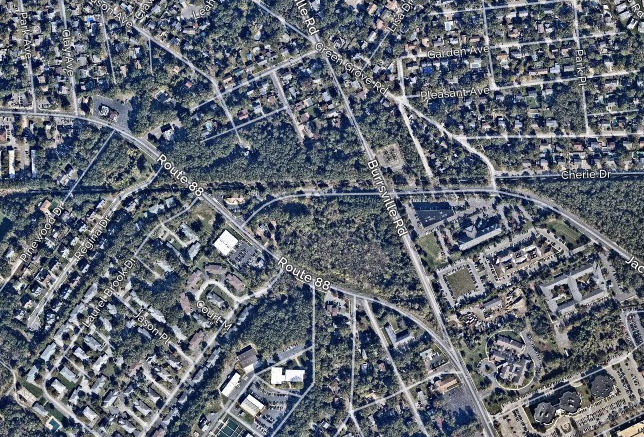 The lot, located along Route 88, Burrsville Road and Jack Martin Boulevard, was included in a major rezoning ordinance that had been introduced. Under the ordinance, the plot of land would be removed from the Mixed Use Overlay Zone, where apartments and retail are allowed, and switched back to the Hospital Support Zone, where residential units are prohibited. The rezoning, described in a separate Shorebeat article, could have major implications for the plot. Kamson unsuccessfully proposed a Marriott hotel at the property, then earlier this year came back to the township and proposed the mixed-use development. If the zoning change passes muster with the planning board and is approved in a second vote by the council on Oct. 9, the standards under which residential property could be built on the site would become significantly more stringent. Judicial decisions and state laws have prevented elected officials from commenting on the plan. Township officials, however, have been hoping the plot could be used for a new Veterans Administration outpatient clinic to replace the overcrowded facility off Route 70. The federal government is looking to buy or lease land on which to build a new clinic. As Shorebeat learned of the cancellation late Tuesday night, there was no one available at Kamson to comment on the matter.